Former presidents Jiang Zemin and Hu Jintao are both MIA at the NPC. Why? On March 8, 2015, Madame Shen Yueyue, vice chairwoman of the 12th National People’s Congress (NPC) of the People’s Republic of China, reported to the second meeting of the third session of the NPC that out of 2,964 deputies, 2,875 were present, and 89 (don’t over-interpret; it’s just a coincidence) absent. That obviously begs the question: who was absent from this meeting? Apparently, former Chinese president Jiang Zemin was absent. The reason could be very simple: he is not a deputy to the 12th NPC. A deputy to the sixth through 10th NPCs, Jiang officially retired from his duty as a “MP” on March 4, 2008. But his absence could also be attributed to his age. At 88, he may not be as active as before, even though he was reported to have “climbed” Dongshan (Eastern Mountain) in Hainan Province just three months earlier. His absence could also be political. The patron of President Xi Jinping, Jiang’s residual power is evaporating very quickly. Many of his former associates (such as General Xu Caihou and Zhou Yongkang) and their children (such as Guo Zhenggang, son of General Guo Boxiong, former vice chairman of the Central Military Commission and member of the 16th and 17th Politburo) have been investigated for corruption, and Jiang is in no position to protect them. Jiang’s name is still occasionally listed in the news releases of the funerals for former high-ranking officials and officers, but he is no longer physically present at any major official functions. He was last seen at the National Day Celebration Banquet on October 1, 2014, when he sat to the right of President Xi Jinping. His absence from the 2015 NPC sessions marks the end of Jiang Zemin era. 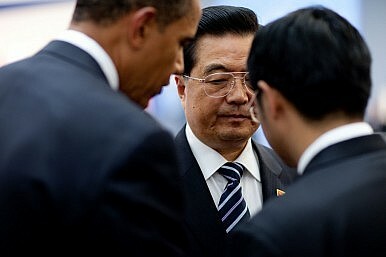 Similarly, Hu Jintao, another former Chinese president, was also absent. Hu attended the first session of the 12th NPC in March 2013 and also sat through the first session of the 12th Chinese People’s Political Consultative Conference (CPPCC). Like Jiang, Hu is not a deputy to the 12th NPC. A deputy to the seventh through 11th NPCs, Hu decided to retire from all of his positions in the Party at the 18th Party Congress in November 2012; he officially retired from all of his government positions at the 12th National People’s Congress in March 2013. Hu was last seen in public along with Jiang at the same National Day banquet, where he sat to the left of Xi. The dismissal of his personal assistant, Ling Jihua, for corruption was a major embarrassment for him, but Hu’s name is less tainted than Jiang’s. And at the age of 72 (16 years younger than Jiang), Hu still has a long way to go before “seeing Marx.” Hu probably chose to be absent from the public scene in 2015. As a retiree, he does not have to stay in Beijing — where PM 2.5 pollution has been several times higher than healthy levels — and can thus preserve his health for the future. As neither Jiang nor Hu are actually delegates to the 12th NPC, they aren’t included in the count of 89 absent deputies. So who are they and why were they missing? That remains to be seen. Where does Xi Jinping fit in China's political spectrum? And what does this mean for the rest of his time in power? China's State Media Tells Retired Officials to Stay RetiredAide to China's Former President Expelled From Party, to Face TrialA Turning Point in China’s Anti-Graft CampaignFomer Hu Jintao Aide Falls to President Xi's Anti-Corruption DriveLi Keqiang's Work Report: Old Problems, New Solutions?